A good friend of mine asked me for suggestions about buying a DSLR today and it got me thinking – maybe it’s time that I upgraded mine too! But I needed an excuse. I think that I’ll just use my soon to be released Law exam results as an excuse, regardless of how well or badly I do. It’s darn sad that I have to invent an excuse to justify buying a new DSLR to myself! So, I looked up my favourite brand – Pentax – with a simple requirement. I wanted a camera that was water resistant. The reason is because I usually take my camera with me on holidays and I usually spend my time out-doors. So, I’ll need a weather proof camera. It also helps when the cops spray you with water cannons. The thing that I love about Pentax is the sheer lack of choice. 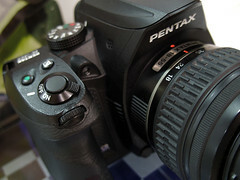 Turns out that there is exactly one model from Pentax that is weather proof and it comes in three colours – Pentax K30. Nice! It also comes with an option of a 18-135mm kit lens. Since I already have the 18-55mm and 55-200mm lens, this would be more than suffice. I think that the kit lens would be good enough for general use during holidays – shooting people, scenery and random architecture. I no longer need to fret over which lens to use. Also, I’ll have the opportunity to use the camera soon as I’ll be travelling to Taiwan, Berlin and Nice in the next few months. All very nice timing. Now, if the shop will do me a 0% credit-card instalment payment, I’m set! PS: I need to buy myself a prime lens at some point.